The 2017 CareerBuilder Challenge golf tournament on the PGA Tour is taking place this week from January 19-22, 2017, at the PGA West Stadium Course located in La Quinta, California. Here is a list of the prize money up for grabs of PGA golfers playing at the 2017 CareerBuilder Challenge. The CareerBuilder Challenge is the third PGA Tournament in the calendar year of 2017 but it is not the third tournament of the 2017 PGA season which began last October. Arnold Palmer (1960, 1962, 1968, 1971, 1973) holds the record for most wins with five. 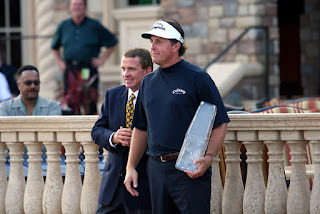 Phil Mickelson (2002, 2004) is one of six players tied for 2nd most wins with two each. Patrick Reed won this event in 2014. Both Patrick Reed and Phil Mickelson are playing in the 2017 CareerBuilder Challenge and they are the two top ranked PGA golfers in the playing field this week. Total prize money up for grabs at the 2017 CareerBuilder Challenge is $5.8 million. That's the same amount of prize money that was up for grabs here last year. The winner of the 2017 CareerBuilder Challenge will earn a cool $1.044 million in prize money. That's the same amount of prize money that Jason Dufner earned last year when he won this tournament. Second place is worth $626,400 at the 2017 CareerBuilder Challenge. That's the same amount of prize money that David Lingmerth earned when he finished alone in 2nd place here last year. Third place at the 2017 CareerBuilder Challenge is worth $394,400. Phil Mickelson, Andrew Loupe and Kevin Na split $904,800 with each player earning $301,600 when they all tied for 3rd place here last year. Fourth place is worth $278,400 at the 2017 CareerBuilder Challenge.